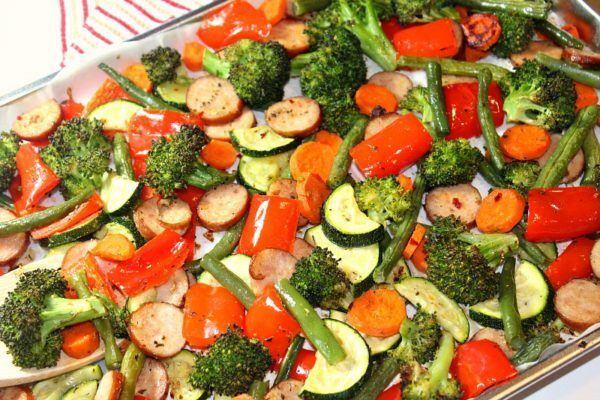 A flavorful Low Carb Sage Sausage and Veggie recipe made in a sheet pan. A great idea for a healthy meal prep or easy low carb dinner. Preheat oven to 400 degrees F. Line 2 sheet pans with parchment paper (do not use foil). I used one big and one medium sheet pan. Veggie Prep: Wash all veggies. Peel and slice carrots into small circles. Place in large mixing bowl. Trim ends of green beans and cut in half. Halve zuccini on the long side and face straight side down and slice into 1/4″ half moons. Chop broccoli so you only have florets. Remove seeds and skins from red peppers and chop into bite-size pieces. Chop sausage into 1/4″ circles. Add all veggies and sausage into large mixing bowl. Combine all of the seasonings into small bowl. Whisk together. Add half of the oil & seasoning mix onto veggies and sausage, lightly toss to coat. Pour veggie and sausage mix onto sheet pans, and spread out. (It’s okay if ingredients overlap some). Drizzle remaining oil & seasoning mix over the veggies and sausage. Place in preheated oven for 15 minutes. Remove and toss ingredients. Return to the oven for 10 minutes, until veggies are tender. Remove and top with fresh chopped parsley or Parmesan cheese, if desired. Serve with rice, if desired. (For meal prep, store in refrigerated containers for up to 4 days).